Following a contentious hearing that lasted most of the day on Feb. 7, the San Luis Obispo County Board of Supervisors voted 3-2 to oppose the formation of a Chumash Heritage National Marine Sanctuary off the coast of SLO and Santa Barbara counties. The Northern Chumash Advisory Council submitted an application to create a marine sanctuary, stretching 140 miles from Cambria to Santa Barbara, to the National Oceanic Atmospheric Administration (NOAA) in 2015. That application is currently under review by NOAA and a final decision on it may take up to five years, according to NOAA. 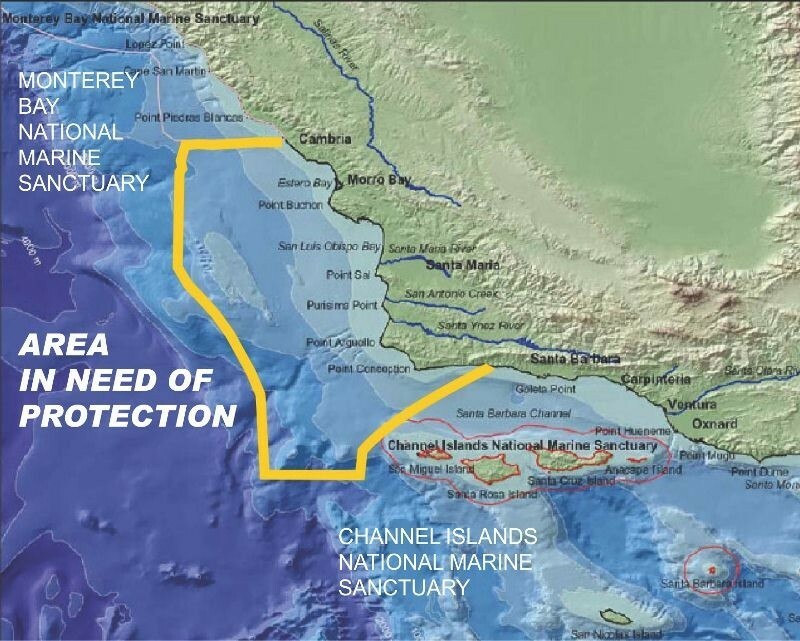 To its supporters, the Chumash marine sanctuary would effectively close the gap between the Monterey Bay and Santa Barbara Channel Islands national marine sanctuaries, definitively protecting Central Coast waters from offshore oil drilling or fracking. While SLO County does not have decision-making authority over whether the application is approved by NOAA, supervisors Debbie Arnold, John Peschong, and Lynn Compton requested that the county craft a resolution in symbolic opposition to the sanctuary at a Jan. 24 board meeting, where NOAA updated the board on the application’s status. More than 100 community members packed the board chambers on Feb. 7 to speak to the supervisors about the item, and supporters of the sanctuary held a demonstration in the county building’s lobby prior to the meeting. After hours of public comment, Arnold, Peschong, and Compton cited opposition from several local fishermen’s associations, organizations like the Morro Bay Chamber of Commerce and the city of Morro Bay, as well as disagreement among local Native American tribes about the sanctuary as reasons for the resolution. “We have so many organizations, viable organizations, in our community that have concerns with this,” said Arnold, who led the action to have the county state its opposition in writing. Supervisors Bruce Gibson and Adam Hill called the move premature and politically motivated. They challenged the majority’s view that a marine sanctuary would lead to a loss of local control, since the waters off the California coast are regulated by the California Coastal Commission and the federal government, not SLO County. Gibson stated his belief that there would be ample opportunity for discussion with commercial fishermen to make the sanctuary work for all. Strife about the resolution also stirred up accusations from community members that the supervisors against the sanctuary were tacitly supporting offshore drilling activities. Northern Chumash Tribal Council spokesman Fred Collins alleged in his public comment that Compton told him directly she would like to see oil activities near Avila Beach. “I haven’t taken a penny from oil in my campaign,” she said. While Compton did not receive donations directly from oil drillers during her 2014 campaign, she did receive $4,600 from individuals or companies with ties to the oil and gas industries, according to campaign finance disclosures. Among the donations are $900 from energy consultant Bruce Falkenhagen, who was fined $100,000 by Santa Barbara County in 1998 for deceiving regulatory agencies while operating an energy plant without pollution controls. She also received $150 from Robert Poole, who at the time was a public affairs consultant with Santa Maria Energy; $350 from Frank W. Smith, a consulting engineer for Pacific Coast Energy Company; $250 from JB Dewar, a Central Coast fuel distributer; and $2,500 from three propane companies. Compton told New Times on Feb. 8 that those donations did not influence her decisions as supervisor. Campaign finance forms also show that Supervisor Peschong and Supervisor Arnold received $12,654 and $5,850 respectively from individuals or companies with ties to the oil and gas industries. For Peschong, donations included a combined $1,175 from Chevron’s Philip Maysonave, Sempra Energy, and Vaquero Energy, as well as thousands from political consulting firms across the country that have contracted with oil or gas companies—similarly to Peschong’s consulting company, Meridian Pacific Inc., which has contracted with Phillips 66. Among the donations from consulting firms was $2,500 from FP1 Strategies in Washington, D.C., which, on its website, touts its role in a campaign to expand offshore drilling in the United States. According to campaign forms from their most recent elections, the dissenting Supervisors Gibson and Hill did not receive any donations from individuals or companies with ties to the oil and gas industry. Hill did receive $150 from Royden Nakamura, a marine biologist; and $100 from Timothy Duff, a California State Coastal Conservancy planner. In response to the anxiety about offshore drilling, the board agreed to include a statement in the oppositional resolution that affirmed support for Measure A. Passed in 1986, it requires that any permit granted to an onshore oil facility be decided by public vote. The board also directed staff to bring back an analysis of U.S. Rep. Salud Carbajal’s (D-Santa Barbara) proposed Clean Coast Act, which would permanently ban oil and gas leasing off the coast of California. Compton indicated her support for Carbajal’s legislation, but Arnold said she hadn’t read the bill and would need time to consider it. This entry was posted in Chumash, Cultural Resources, Heritage, News, Protection & Preservation, Sacred Sites. Bookmark the permalink.